The stylish loungebox contains all until today released CDs of the klassik lounge series, Werke 1-8. 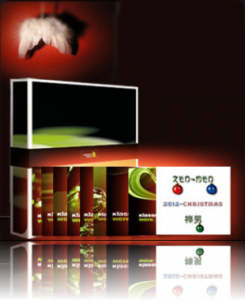 For the xmas-box you additionally get the ZEN-MEN “2512-Christmas” CD. Thats about 21 hours of pure music pleasure. Preorder now! Available 20th November 2009. Die stylische Loungebox enthält alle bisher erschienen CDs der klassik lounge, die Werke 1-8. Für die xmas-Box legen wir Ihnen noch die CD ZEN-MEN “2512-Christmas” dazu. Das sind ca. 21 Stunden purer Musikgenuss. Jetzt vorbestellen! Lieferbar ab 20. November 2009. This entry was posted in ZEN-MEN and tagged Christmas, Deutsch, English, music, ZEN-MEN on November 18, 2009 by Chris.